Tuesday, 5 February 2019, 3:03p.m. 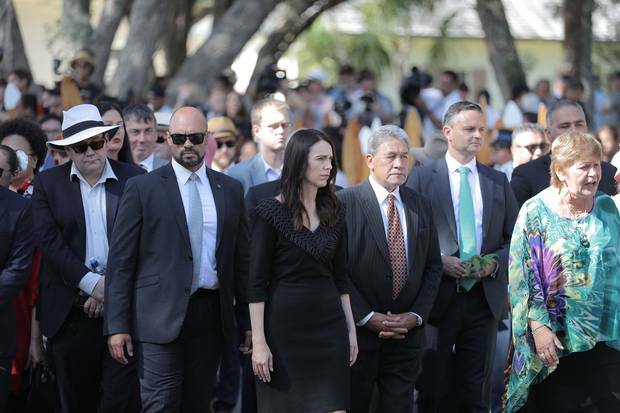 A woman was removed from outside the upper marae at Waitangi as Prime Minister Jacinda Ardern and Crown ministers were formally welcomed. The woman could be heard shouting "don't you come to this marae" as she was removed. Media were told she was not a protester but was upset about something else. In her speech, Ardern greeted those gathered in Māori and said she was back to be held to account, as she promised when she spoke at Te Whare Runanga last year. Ardern outlined what the Government had done that would improve life for Māori, such as reducing unemployment, increasing benefits and the Working for Families package. With each of the achievements she mentioned though, Ardern emphasised "there is still more to do". "The past 12 months have taught me what a journey we must go on together." She called the Government's work so far for Māori a "foundation". "I believe that if we can make the progress we've made in one year, imagine what we can do in 10 years," she said. "I will not give up on the challenges we face together." Building on the foundation would create the bridge "between the two Houses". NZ First leader and Deputy Prime Minister Winston Peters said the Government was setting about dealing with some "enormously" difficult issues but it was coming equipped with the money to do that. "We are the only ones who can do it." Earlier, the official party of MPs arrived at Te Whare Runanga as a single group for the first time, led by Labour MP Peeni Henare. National leader Simon Bridges answered the challenge and picked up the wero. Greens leader James Shaw then did the same. 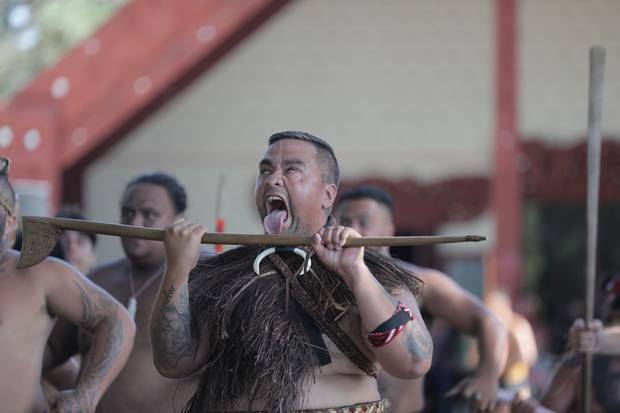 The opening speaker, Bernard Henare, brought up the fraught issue of the Ngapuhi mandate, saying that even as iwi fought among themselves, people were living in poverty. The speeches in te reo were translated into earpieces. It is the first time the technology has been used, and allowing a two-way conversation between Māori and the Crown. The translator struggled to keep up with the speech by NZ First MP and Regional Economic Development Minister Shane Jones. Jones, who is known for his flowery oration, seemed beyond the capabilities of the translator attempt to covert it to English. National's Nuk Korako spoke on behalf of his party. He acknowledged kuia Titewhai Harawira who, like last year, was seated next to Ardern. Bridges, who is Māori, opened his speech in Māori. He joked that Ardern's baby Neve, sitting quietly on father Clarke Gayford's lap nearby, was the best-behaved baby there. "Give it time Prime Minister," he joked. Bridges singled out Crown Māori Relations Minister Kelvin Davis for his work in bringing dignity to the event. He said he agreed with Ardern's view that this was the year of delivery. But he said the Government should not be a benevolent dictator, and National believed people should stand on their own two feet. His party would work with Māori but they should be in the driving seat. "I stand here as the first Māori leader of a major political party."